We all were new at one time, and we remember what it's like. So we've provided the information below because it's easier to venture into a new place when you know what to expect. At Friendship, we want your visit to be the best experience possible. 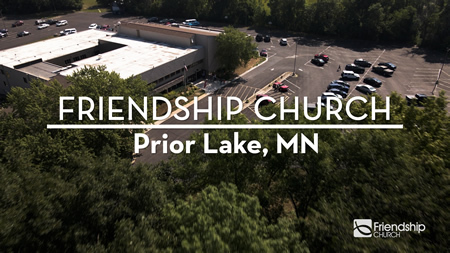 We have two locations: Prior Lake and Shakopee. Sunday services are at 9:00 or 10:45am. Each campus has fresh, contemporary music, live teaching, and Bible-based messages that are applicable for your life today. We want you to feel comfortable during your visit. You'll see people dressed all the way from very casual to their “Sunday best.” We're much more interested in meeting you than in what you choose to wear. If you have a question once you arrive at our church, the best place to go is the Welcome Center. It is staffed with knowledgeable volunteers in red shirts. They will be more than happy to answer questions or help you get to where you need to go. Also, be sure to pick up your first time guest gift bag. Our worship services last approximately 65 minutes. There is singing, prayer, a live message and sometimes a drama or special video. An offering will be taken but is meant for those who have made Friendship their home. Feel free to let it pass by if you are a guest. After the service, enjoy a complimentary cup of coffee and sweet treat. We serve coffee from Urban Ventures, available in a variety of roasts (both regular and decaffienated). We offer excellent, safe, age-appropriate programming for birth through grade 5 during Sunday services. It's our goal to partner with you to raise spiritual champions! Check out our Splash Kids Ministry. Friendship Church Youth Ministry is focused on helping students find and follow Jesus Christ. Grades 6 – 8 meet on Sunday mornings at 10:45am. Grades 9 – 12 from both our campuses come together at the Shakopee Campus on Sunday evenings at 6:00pm. Check out our Youth Ministry. To enhance the worship experience of the Deaf and Hard of Hearing community, we offer an ASL Interpreter at our 9:00am worship service at the Shakopee Campus. Was there something we forgot? Feel free to with any questions.